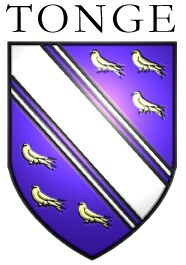 I have received expressions of interest from 25 members of the Tonge family over the last two years, with ancestral roots in Lancashire (11) and Kent (5) and others. Of those 25 people, 11 have sent DNA samples to the laboratory. Success! The DNA project has succeeded in satisfying one of it's initial objectives, which was identifying a genetic fingerprint for the Tonge family of Bolton. Five people called Tonge, all with ancestors hailing from the Bolton area, but with no family tree links in the last 200-300 years, all have matching DNA. That means that they must all be descended from a common ancestor. How can DNA help in genealogy? The Y chromosome is passed from father to son unchanged, except for a mutation about every 500 generations. Testing the Y chromosome will provide you with a genetic finger print consisting of 12, 25, 37 or 59 numbers. By comparing this finger print to others with your surname, you can determine if they are related. In line with most other surname DNA projects, there are several objectives, and they may change over the life time of the project, depending on the specific interests of the participants. To prove, or disprove, the theory that the different Tonge families originating from various areas of England (Lancashire, Yorkshire, Kent, Lincolnshire etc. ), are in fact entirely separate families, not genetically related. That each family took their name from a local place called Tonge, of which there are at least six in England. To validate relationships suggested by existing genealogical research, and to help solve brick walls in research where documented sources have been exhausted. To compare DNA results against other worldwide results in order to indicate the ancient origins of the family. The haplogroup of the project participants so far is R1b1. This is the most common haplogroup in Western European populations today. It is believed to have originated in the peoples who took refuge in Iberia during the last ice-age. At the end of the ice-age (10-12K years ago) humans from this region migrated up the Western coast of Europe and partly into central Europe. Five of the participants cannot be shown to be related through paper records, but the Y-DNA test shows that they probably are related, although fairly distantly. The results suggest that they probably share a common male ancestor within the last 350 - 800 years. Five participants have the marker value DYS390=23. A number of studies have suggested that this value is indicative of "invader" origins from the Teutonic countries, maybe therefore Anglo-Saxon or Danish in origin. Research looking at the geographic frequency of DYS390 = 23 combined with DYS391 = 10 show that this genetic signature occurs most frequently in South East Germany, and is not found frequently in Sweden or Norway. Contact me at stephen.tonge@tongefamily.info so that we can make arrangements to have a test kit sent to your house.